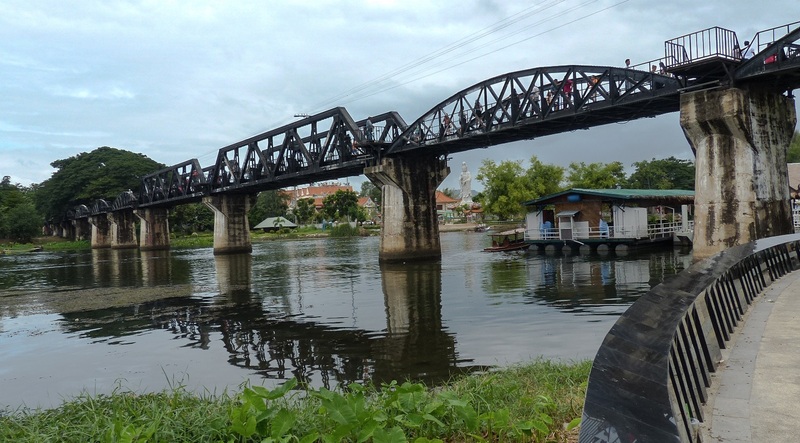 You may not have heard of Kanchanaburi, but there’s a strong chance that you’re familiar with the 1957 Academy Award winning dramatic film ‘The Bridge Over the River Kwai’, which was set here. 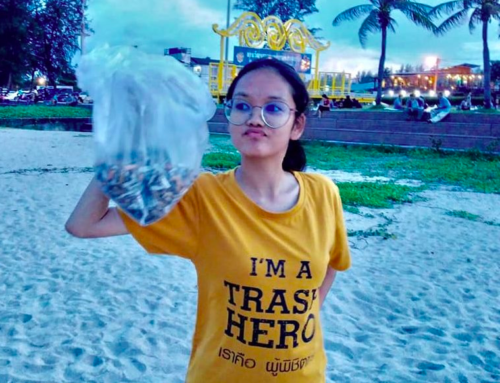 A couple of hours from Bangkok in western Thailand, Kanchanaburi province holds a graver message than most of Thailand’s tourist destinations. 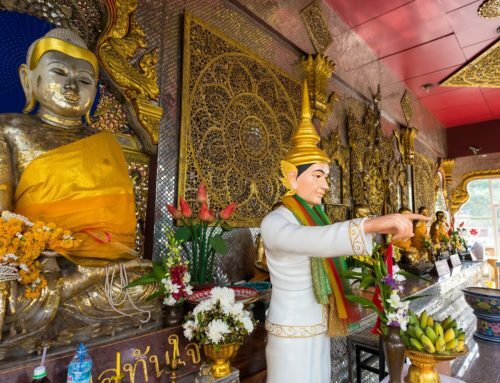 It may today hold a thriving tourist scene, but Kanchanaburi town is steeped in difficult history. During WWII, Japanese forces used Allied prisoners of war and conscripted Asian labourers to build a rail route between Thailand and Burma. The harrowing story became famous after the publication of Pierre Boulle’s book The Bridge Over the River Kwai, and the film that followed. 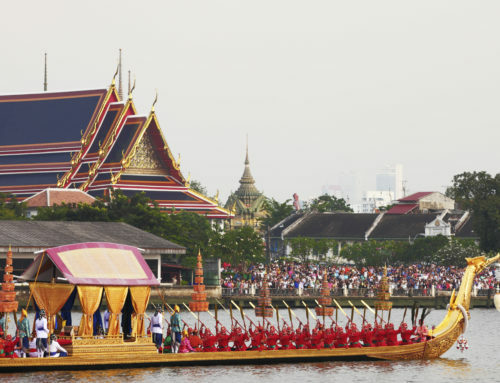 Thailand was still known as Siam when Japan invaded it in December 1941, until then the country had been officially neutral. The invasion meant that Japanese troops could pass through the country en route to invade Malaya, modern-day Malaysia and Singapore, and Burma, now Myanmar, both British colonies. Of all the war history in Thailand today, those in Kanchanaburi are probably the most significant and poignant. Following their invasion, with free access to Siam’s infrastructure, Japan sought to create a transportation route through Siam into Burma, which it also occupied between 1942 and 1944. This took the form of the now infamous Death Railway, constructed by the Japanese using the forced labour of hundreds of thousands of civilians from Southeast Asia and prisoners of war from the Allied forces. The Death Railway earned its name from the sheer number of lives lost during its construction. Estimates vary but of more than 60 000 prisoners of war enslaved on the Death Railway, almost 13 000 are believed to have died, in addition to an estimated 90 000 southeast Asian enforced civilian labourers. Many people died from accidents, starvation, sickness and murder. Statistics indicate that one person died for every sleeper along the 415-kilometre railway. At unspeakable human cost, Japan’s Death Railway was completed in October 1943. For a time it was operational, although damage caused by British and American air raids rendered it unworkable in June 1945. It wasn’t until the war’s end in 1945 that Allied forces liberated the Death Railway’s remaining prisoners. The railway itself was fully closed in 1947. The Bridge on the River Kwai escaped planned destruction and remains in place in Kanchanaburi as a tourist attraction and functioning railway bridge over which trains pass daily. The majority of its smaller components are originals, while others have been used in restorations over the years. 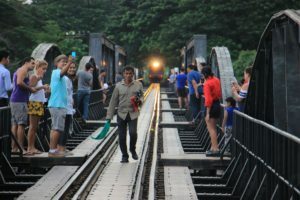 Although the Death Railway has never again reached the Myanmar border, a shorter stretch was reopened by Thailand’s railway authorities between 1949 and 1958 and trains on this modern-day line cross the notorious Bridge on the River Kwai. An even more significant war-related site, located off the train tracks today but originally part of the Death Railway’s construction, is Hellfire Pass. Since it involved cutting through sheer mountain face, this was among the most demanding parts for the forced labourers and where large numbers perished. The site has been preserved as a memorial museum and walking trail. It is a sobering but worthwhile destination. The infamous railway line reaches Nam Tok Sai Yok Noi station, another war-related attraction. 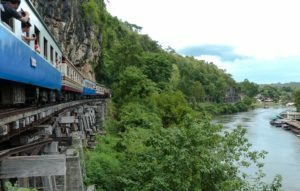 It is around a two-kilometre walk from the Sai Yok Noi waterfalls, and as far west to the Myanmar border as is possible to get by rail. 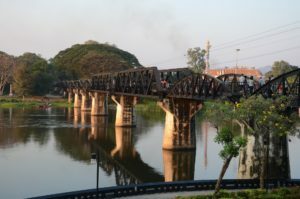 Trains from here trace their way back over the Bridge on the River Kwai, before heading through the provincial capital’s Kanchanaburi station one stop southeast, all the way to the Death Railway’s original starting point at Nong Pla Duk in neighbouring Ratchaburi. There, the track connects with Thailand’s main southern line from Bangkok, allowing trains to continue to the Thai capital’s old Thonburi station. 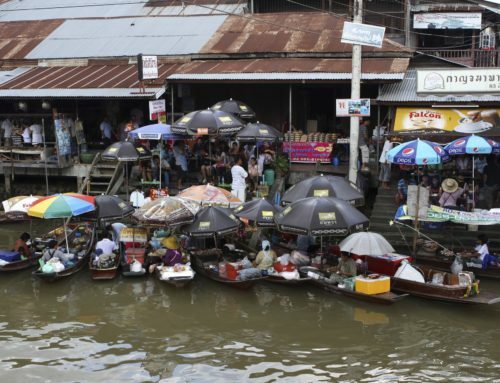 Today the stunning River Kwai is an ideal destination for a holiday with luxurious resorts and fine-dining restaurants clustered along its banks, providing an amazing selection of cuisine and accommodation. 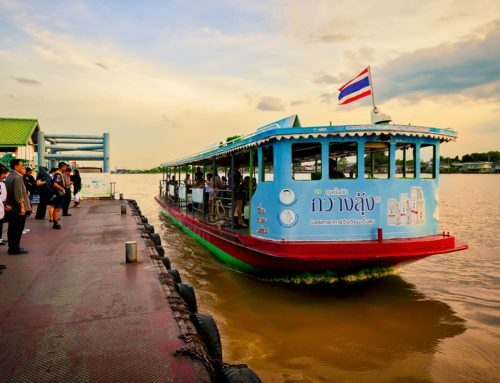 You can opt to dine on one of the waterway’s famous floating restaurants.